With our excellent customer service and low prices on all the highest quality, top brand models, National RV Detroit is one of the best RV dealers in Michigan - and the nation! With the New 2019 Forest River Salem 31KQBTS, you'll be able to travel all over the country in style and comfort! You'll find excellent deals on this Travel Trailer and other terrific models at National RV Detroit, located at 44700 N I 94 Service Dr Belleville Michigan 48111! Call us at 734-439-3400 and talk to one of our friendly, knowledgeable experts for more information on this RV! You'll save $1000s! And with our fast, reliable, 24/7 delivery anywhere in North America, you'll be in your dream RV before you know it! Once you've reached your destination, you can easily pop out the 18' 0" awning and enjoy some welcome shade and UV protection! This rig has a GVWR of 10953 lbs. and a hitch weight of 793 lbs. 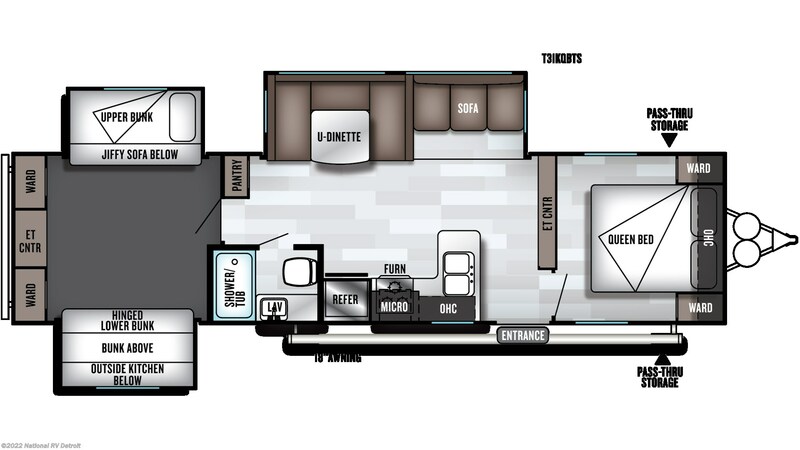 The 3 slides maximize the living space in this 36' 6" long, 8' 0" wide Travel Trailer! Enjoy spacious and gracious living in this 36' 6" long, 8' 0" wide and 11' 3" high Travel Trailer! It has 3 slides to maximize the space, and the climate inside will stay pitch-perfect no matter how bad the weather is outside thanks to the modern 13500 BTU a/c unit and the efficient 25000 BTU furnace! The bathroom has a Foot Flush toilet and a shower, with water heated by 40 lbs. of LP tank capacity! The 54 gallon gray water tank and the 27 gallon black water tank store used water and waste, respectively.andnbsp;Whether you've got lots of kids or lots of friends, they'll all sleep cozy and secure in the roomy bunkhouse with its Quad Bunkbeds!andnbsp;This model comes with an outdoor kitchen for summer fun and picnics in the fresh air and sunshine! Check out Stock # 6787 - 2019 Forest River Salem 31KQBTS on forestriverrvsource.com!